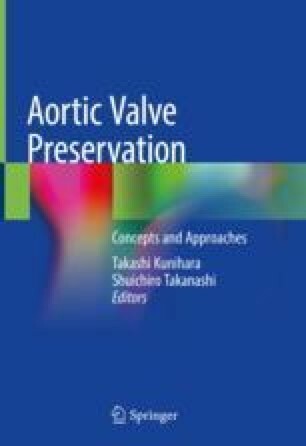 Aortic valve replacement (AVR) is applied as a surgical treatment for aortic valve regurgitation (AR), and if root enlargement is seen, aortic root replacement is performed. The results of these procedures are acceptable, but problems can arise from the implanted artificial valve. These problems include hemorrhagic complications caused by thromboembolism, infection and dysfunction of the artificial valve, and in the case of mechanical valves, warfarin administration, and all impart serious risk to the patient [1–3]. In a young population, exercise capability should be guaranteed, and body growth should be taken into account; therefore, an operation incorporating an artificial valve cannot be said to perfect.